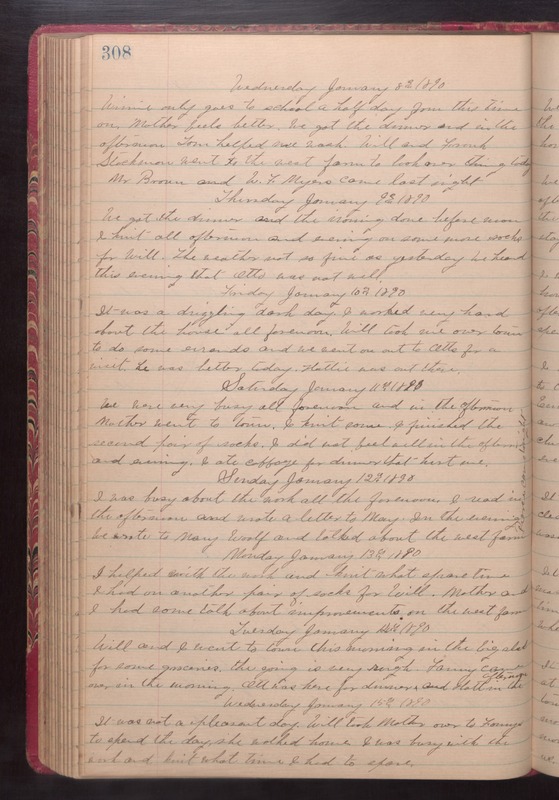 Wednesday January 8th 1890 Winnie only goes to school a half day from this time on. Mother feels better. We got the dinner and in the afternoon Tom helped me wash. Will and Frank Stockman went to the west farm to look over things today Mr Brown and W. F. Myers came last night. Thursday January 9th 1890 We got the dinner and the ironing done before noon. I knit all afternoon and evening on some more socks for Will. The weather not so fine as yesterday. We heard this evening that Otts not well. Friday January 10th 1890 It was a drizzling dark day. I worked very hard about the house all forenoon. Will took me over town to do some errands and we went on out to Otts for a visit. he was better today. Hattie was out there. Saturday January 11th 1890 We were very busy all forenoon and in the afternoon Mother went to town. I knit some. I finished the second pair of socks. I did not feel well in the afternoon and evening. I ate cabbage for dinner that hurt me. Sunday January 12th 1890 I was busy about the work all the forenoon. I read in the afternoon and wrote a letter to Mary. In the evening We wrote to Mary Woolf and talked about the west farm. [the following text is written vertically in the right margin of the above entry] Pierce come tonight. Monday January 13th 1890 I helped with the work and knit what spare time I had on another pair of socks for Will. Mother and I had some talk about improvements on the west farm. Tuesday January 14th 1890 Will and I went to town this morning in the big sled for some groceries. the going is very rough. Fanny came over in the morning. Ott was here for dinner and Hattie in the afternoon. Wednesday January 15th 1890 It was not a pleasant day. Will took Mother over to Fannys to spend the day, she walked home. I was busy with the work and knit what time I had to spare.